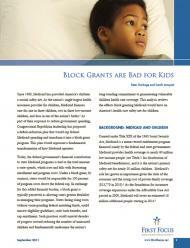 Commissioned by First Focus and authored by Peter Harbage and Sarah Arnquist, this report describes the enormous success of Medicaid in increasing health insurance coverage among children and examines the dangers of block grants for children, including the possibility of reduced services and increased out-of-pocket costs for parents. More broadly, the report describes how Medicaid block grants would diminish the federal entitlement that has ensured health access for millions of Americans. The report finds that a block grant would end Medicaid as we know it, causing states to reduce enrollment, limit benefits, cut provider payments, and shift more costs onto the children and families who rely on public programs.